Stopping US military intervention in Syria, pushing negotiations with Iran, putting the spotlight on drone strikes. 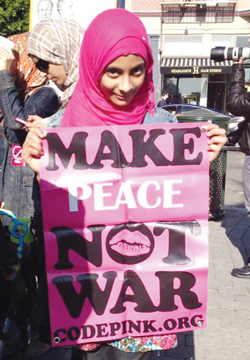 Thanks to your help, CODEPINK and the peace movement have gained tremendous momentum this year. Please keep the momentum going with a generous donation. Our international drone conference had over 400 enthusiastic attendees from around the globe, and formed the basis of a global antidrones network. Medea toured with her book, Drone Warfare: Killing by Remote Control, to over 100 cities. We derailed the confirmation hearing of John Brennan to head the CIAmaking national news about Brennans infamous role in targeted killings. 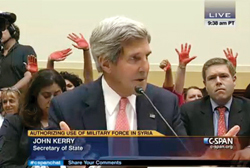 We set up a 24/7 peaceful insurrection encampment outside Congress to prevent a US war on Syria, (our bloody hands waving over John Kerrys head in Congress went viral). We teamed up with MADRE to raise money for women in Syrian refugee camps and sent 1,000 solar lamps to combat the rampant rapes at night (thanks to your contributions!). 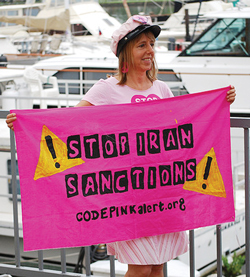 We delivered over 20,000 signatures, including prominent women, to many top staffers inside the White House calling for negotiations with Iran. We exposed AIPAC with exciting and creative actions inside and outside their annual conference, while hosting a counterconference of our own about peace and human rights, attended by 300+ people. With our Stolen Beauty and Stop SodaStream Boycott campaigns, we have continued our coalition work with national and international partners helping to take the profit out of occupation and to hold Israel accountable for its violations of international law. After the Sandyhook massacre we partnered with Mayors across the country to say Arms Are for Hugging, end the sale of assault weapons. Joining with other national groups, we successfully pushed for the military not to be exempt from the national budget cuts. CODEPINKers across the country danced in solidarity with Eve Ensler and millions of others across the world for One Billion Rising on VDay to call for an end to violence against women. CODEPINKers from all over the US stood in solidarity with Wendy Davis from Texas to support womens reproductive rights. We held protests in solidarity with human rights activists jailed all over the world, from Bahrains human rights leader Nabeel Rajab to Qatari poet Muhammad AlAjami. We joined memorials for Trayvon Martin, and protested racial profiling by law enforcement in the US. We journeyed to Yemen to meet with the families of drone strike victims and Guantanamo Bay prisoners, bringing their stories back home. 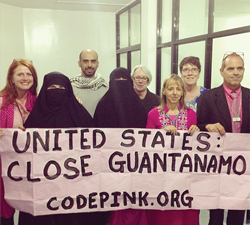 We took dramatic actions in solidarity with the hunger strikers at Guantanamo Bay prison to demand its closureDiane Wilson even hopped the White House fence and Medea Benjamin questioned President Obama directly during his national security speech! 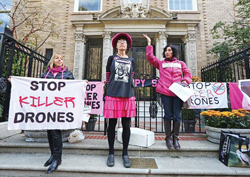 We attended the trial and verdict of brave whistleblower Chelsea Manning, and set up the CODEPINK Chelsea Manning Support Network to support her during her incarceration. 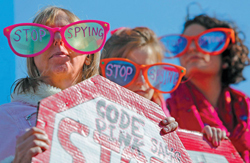 We protested NSA mass surveillance (our oversized Stop spying glasses in Congressional hearings were an important part of the story) and supported whistleblower Edward Snowden. Our messages spread far and wide from photospreads in TIME Magazine, stories on NPR, to frontpage New York Times coverage. We refused to let war criminals go on speaking tours without being held accountable. We teamed up with Iraqi mother Sundus Shaker Saleh to sue George Bush and five members of his administration for crimes of aggression against Iraqi civilians. The lawsuit is based on the Nuremberg trial legal precedent that convicted Nazi leaders. 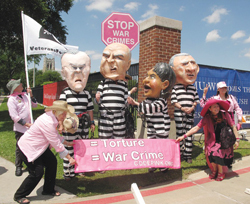 We converged in Dallas, Texas, to protest the shameful opening of the George W. Bush Library and Policy Center. We will build on our success campaign against killer drones in the US to build an international movement against killer and spy drones. Working with family members of current and former Guantanamo prisoners, we will pressure the Obama administration to finally shut down the facility. We will honor the sacrifices of heroic whistleblowers like Chelsea Manning and Edward Snowden by mobilizing against government intrusion into our private lives. We will work in our communities to spend money on human needs, not the war machine, and spread the message that Arms are for Hugging. 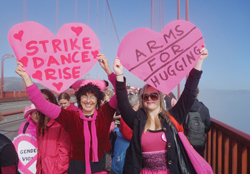 Your tax deductible year-end donation will help CODEPINK continue to speak truth to power in the most creative and effective ways. Please give today.